This Easy Lasagna Recipe Makes a Simple Weekday Dinner – Filling, Cheesy and Delicious! Our entire family loves this easy, homemade lasagna. It’s so simple to make from scratch. The cheesy baked flavor is the best! You can also change up this classic recipe with new flavors by adding different veggies or cheeses. No matter what ingredients you decide to include, you can’t go wrong with this pasta and cheese combo. Head to the kitchen to make this yummy, hearty lasagna now! And on’t forget to make dinner rolls or this beer bread to go with it! When I have the time, I love to putter around in the kitchen. When I don’t have time, I just want to get a good meal on the table ASAP. To be honest, that’s real life on most nights. For me, a good meal is this easy lasagna. For a good from scratch lasagna, you’ll need four basic things – a hearty filling (meat/veggies), pasta sauce, cheese and lasagna noodles. If you’re looking for a meat-filled lasagna, pick up a pound of lean ground beef or chicken. Take away the meat and make the lasagna vegetarian by subbing sauteed spinach, zucchini and eggplant. Or just sneak in some sauteed veggies for the kiddos or make it veggie and meat loaded lasagna. But you really can’t go wrong with either! 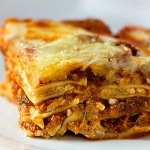 I personally love adding veggies for a more robust lasagna. Next up is the spaghetti sauce. You can make your own tomato sauce or used a jarred sauce. Original, garlic or four cheese flavored – just go for whatever flavor you’re feeling that day! And of course, you can’t have a lasagna recipe without everyone’s favorite – cheese! This lasagna recipe is with cottage cheese, mozzarella and parmesan but we also love this lasagna with ricotta cheese in place of the cottage. Whatever keeps the taste-buds in the house happy! Last but certainly not least, the noodles. If you are looking for a gluten-free lasagna, sub the normal lasagna noodles for gluten-free noodles. I love anything that involves minimal prep work – which is why I love this easy lasagna! The quicker the lasagna is in the oven the happier my stomach (and family) will be. Pull out your favorite skillet, preheat the oven to 350 degrees and let’s get to creating a cheesy lasagna masterpiece. In the skillet, heat up your ground meat with half an onion. Sizzle until the meat for 5 minutes, drain the grease and then pour in the spaghetti sauce. If you’re headed the veggie route – saute your desired veggies and add in the spaghetti sauce like normal. Mmm – your kitchen should be smelling delicious! Time to get cheesy! In a large bowl, combine all of the cheeses – cottage, mozzarella and half of the parmesan with salt and ground black pepper. Now onto creating this classic masterpiece. In a 11×7 pan, pour out some of the pasta and meat sauce. Layer with 3 of the uncooked lasagna noodles, then add the cheese mixture and more of the meat and sauce on top. Repeat the layering twice and top with the remaining cheese and sauce mixture then pour ½ cup of water around the edges. Cover with aluminum foil and bake in the preheated oven for 45 minutes. Then, uncover then send it back in the oven for an additional 10 before serving. Delicious and easy lasagna with minimal prep work – the best! For this easy lasagna, it only takes a total of 55 minutes in the oven. Bake covered for 45 minutes in a 350-degree oven. After 45 minutes, pull out the cheesy lasagna and uncover. Pop it back and bake for an additional 10 minutes. Pull it out, let it cool and dig in! For a fun alternative, you could also try these lasagna roll ups, too. This lasagna recipe is so filling with all the major food groups involved I like to keep it simple with side dishes. A great side dish to serve with lasagna is a salad! One of my favorites is this simple homemade caesar salad. There’s no such thing as too much Caesar salad in my opinion! Another favorite is a side of sauteed vegetables. 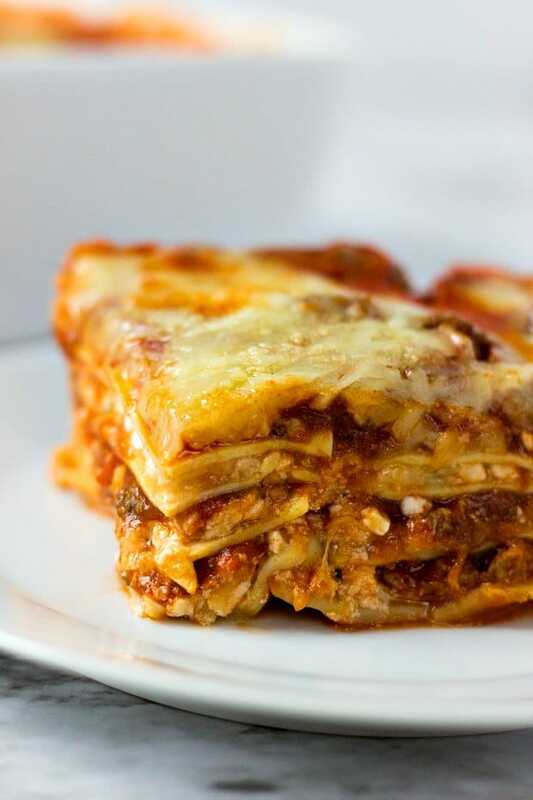 Eggplant, zucchini, onion and spinach go best with a meat-filled cheesy lasagna! These cheese biscuits tastes GREAT on the side! Heat them up and put butter on them. Can this Lasagna Be Frozen? Yes, yes, yes! When life gets hectic, frozen lasagna is the answer. The next time you whip up this simple recipe, make two! One for now and one for later. 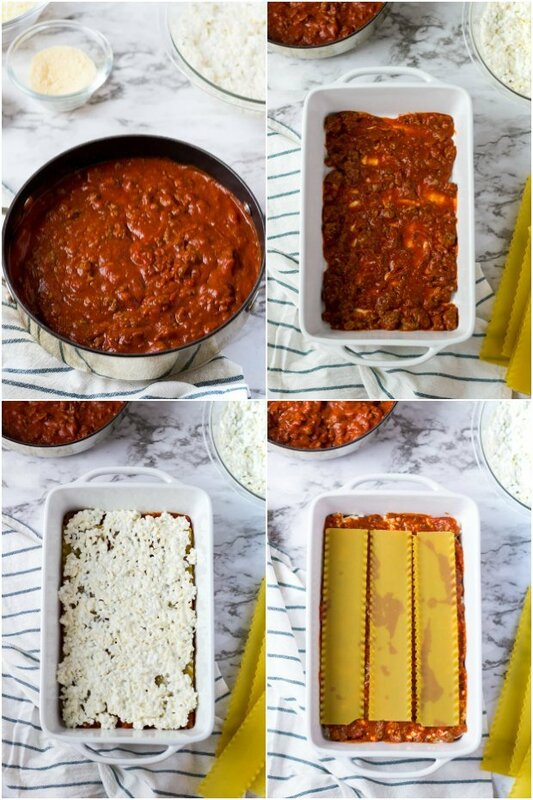 Assemble the lasagna like normal but instead of popping it in the oven, pop it in the freezer. Make sure your casserole dish is in an air-tight container or tightly sealed with plastic wrap. A properly sealed lasagna can stay in the freezer for up to 3 months. Your future self will thank you! When the time has come and you’re ready to dig into your frozen lasagna, let your homemade lasagna thaw in the refrigerator overnight. One hour before dinner time, pop the thawed lasagna in the oven, covered, for 50 minutes at 375 degrees. Pair with your favorite side dish, sprinkle with fresh parmesan and enjoy! If you are looking for other great pasta dishes, check out this baked ziti recipe or this one for baked spaghetti. 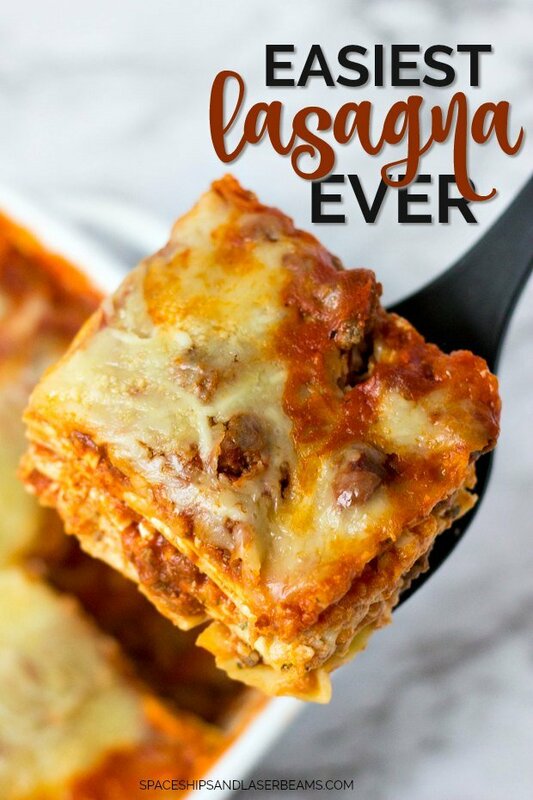 This easy, hearty, homemade lasagna is so simple to make from scratch and offers delicious, cheesy flavor you'll love! In a large skillet over medium heat brown the ground beef and onion. Drain grease, add spaghetti sauce and simmer 5 minutes. In a large bowl, mix the cottage cheese, 2 cups of the mozzarella cheese, half of the grated Parmesan cheese, dried parsley, salt and ground black pepper. To assemble, in the bottom of a 11x7 inch baking dish, evenly spread 3/4 cup of the sauce mixture. Cover with 3 uncooked lasagna noodles, 1 3/4 cup of the cheese mixture, and 1/4 cup sauce. Repeat layers twice. Top with 3 noodles, remaining sauce, remaining mozzarella and Parmesan cheese. Add 1/2 cup water to the edges of the pan. Cover with aluminum foil. Bake in a preheated 350-degree oven 45 minutes. Uncover and bake an additional 10 minutes. Let stand 10 minutes before serving. 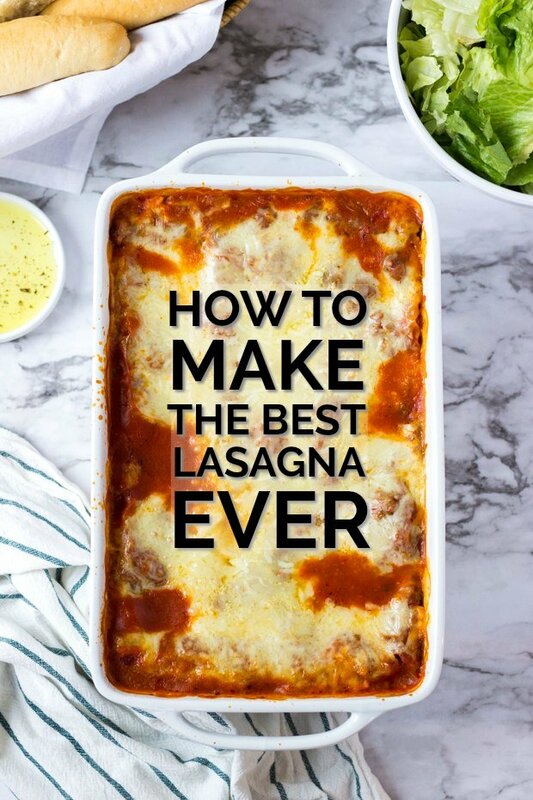 I LOVE lasagna and this recipe is a classic. Perfect for family dinner night. This recipe is fabulous. Made it vegetarian and my kids loved it!